Rev Alistair Macrae was the UCA President, 2009-2013, and in May, 2014, was a participant in a ‘Love Makes a Way’ action in May 2014. (The Pilgrim Ministers, Rev Jana Norman and Rev Sandy Boyce, were also involved with 7 others in another #LMAW action in the office of MP Jamie Briggs, in June 2014). Rev Sandy Boyce & Rev Jana Norman (centre) with others in the #LMAW action to call for the release of children from immigration detention centres. This pattern has been repeated at 24 subsequent actions involving 237 participants. 149 people have been arrested. 66 of them were ministers, priests or rabbis. To my knowledge, nobody has been fined or jailed for these actions. 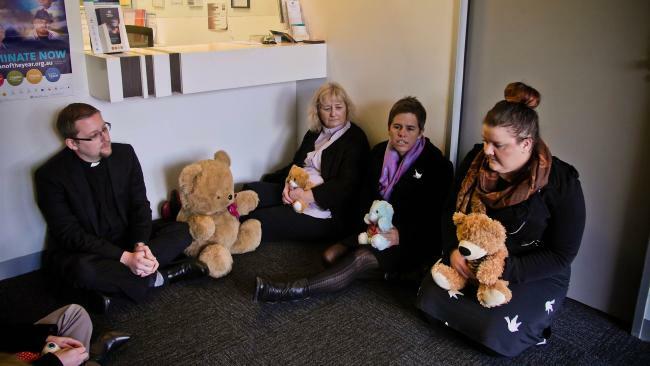 (Update: Rev Sandy Boyce was fined $50!). The events, and many similar subsequent actions, were organised by a loose ecumenical coalition who gather under the banner of #LoveMakesAWay. Nevertheless, many Christian politicians evidently disagree with the churches’ views about asylum seekers and refugees. In 2006 I attended the Bonhoeffer Conference in Melbourne (Dietrich Bonhoeffer was the German theologian executed days before the end of WW2 for his participation in a plot to assassinate Hitler). The keynote speaker was Kevin Rudd who argued that Christianity “must always take the side of the marginalised, the vulnerable and the oppressed”. Of course, it was under Rudd’s leadership in 2013 that the government put in place many of the punitive border protection policies to which the churches now object. It has to be said that within the Christian community the #LMAW approach is not uncontested. The main critique has been that #LMAW uses prayer as a weapon, and that these actions are cheap attention-seeking stunts. Perhaps those critics would use the same arguments in relation to Ghandi’s Salt March or Martin Luther King’s Freedom marches. Karl Barth (another German theologian!) described prayer as “the beginning of an uprising against the disorder of the world,” by which he meant not a will to power, but making our own the purposes and will of another, namely, God. UCA President Stuart McMillan has issued a pastoral letter on the theology of marriage discussions arising at the National Assembly in Perth, and which will continue over the next three years. 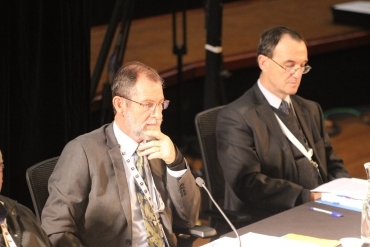 President Stuart McMillan with General Secretary, Rev Terence Corkin, at the 14th Assembly of the UCA. Grace and peace to you in the name of Jesus Christ our Lord. When we gathered as the body of Christ for the 14th Assembly in Perth this passage of scripture was in my mind: “Be completely humble and gentle; be patient, bearing with one another in love, Make every effort to keep the unity of the Spirit through the bond of peace” (Ephesians 4: 2,3 NIV). At the 14th Assembly meeting we received the Report of the Task Group on the Theology of Marriage and Public Covenants for Same-Gender Relationships within the Uniting Church. This work was commenced by the Doctrine Working Group on referral from the 13th Assembly in 2012. A challenging, and at times difficult and emotional, discussion of the report and the proposals arising from the report took place over a number of sessions. The Uniting Aboriginal and Islander Christian Congress exercised its right not to participate in the discussion, but remained in the gathering. The Multicultural and Cross Cultural National Reference Committee urged us through its paper to make ‘space for grace’. I now write to you as members of the Uniting Church expressing the pastoral concerns of the gathering for the whole church. Friends, we continue as a community of culturally and linguistically diverse people to have respectful conversations. We will employ culturally sensitive processes, to be determined by the First and Second people groups within our church. We have been encouraged by the Multicultural and Cross Cultural Ministry National Reference Committee to allow the space for grace. In this space communities will firstly, be able to engage with the concept of marriage and secondly, they may engage with the concept of same-gender relationships. We seek to be an inclusive church that celebrates diversity and embraces LGBTIQ people as full members of the church community. For the times we have failed to be this loving community of Christ and caused hurt, we apologize, ask forgiveness and pray for healing and reconciliation for us all. Christian community modelled on Jesus’ unconditional love and acceptance is what we strive to attain. We know that the world is watching to see how we treat one another. Paul says in Romans we belong to one another, the commandment is to love, to put the interests of others ahead of our own interests. In this next three years my prayer for us all is that we might listen deeply to one another, with our heart and to the Spirit who grants us understanding beyond human wisdom. The Reports and Proposals from the 14th Assembly can be found online here. 70 years ago, at 8.15am on the morning of August 6th, 1945, an atomic bomb was dropped on Hiroshima, killing 140,000 people by the end of that year. Three days later, a second bomb was dropped on the city of Nagasaki, which killed about 40,000 people instantly. These two bombs remain the only bombs used in warfare. It is sobering to know that there are estimated to be 16,350 nuclear warheads in the world, with 2 countries holding 94% of global stocks. Today in advance of the weekend round of AFL, 150 organisations join together to call for renewed efforts to stamp out racism in sport and everyday life. The booing, which has snowballed out of control this year since Goodes proudly displayed his culture during the AFL Indigenous Round, appears to be in large part racially motivated. 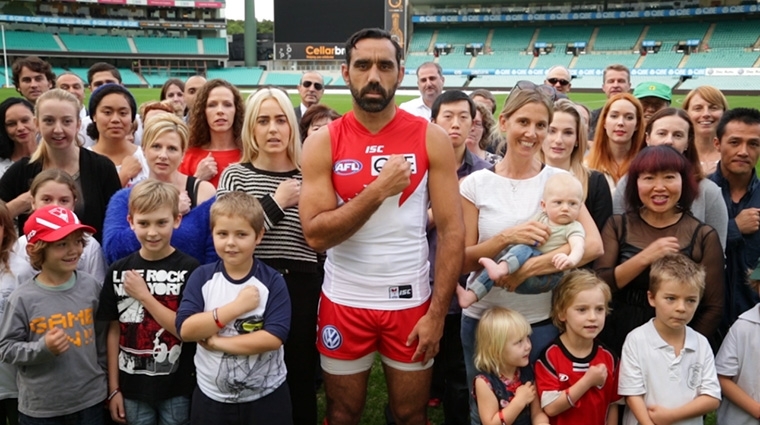 Adam Goodes is an outstanding Australian and should be commended for displaying a culture all Australians should celebrate and be proud of, and for taking a courageous stance against racism. The behaviour of the crowd that booed him is absolutely unacceptable and must stop. To dismiss claims of racism as just banter is to use football as a shield for prejudice. Legitimate barracking for one’s team is a tradition that has been alive as long as the game itself but, when such behaviour coincides with cultural displays and Goodes’ efforts to stop racism, it is clear that a line has been crossed to racial abuse. To suggest that this kind of behaviour does not have an effect is to deny the evidence about the known health impacts of racism. These are not diminished simply because the person being subjected to racial abuse is an elite athlete. It is deeply disturbing that this kind of racism may influence whether a player decides to take the field for one match or is forced out of the game for good. If this isn’t stamped out, then we must ask what message this sends to future generations of Australians about the forms of behaviour that we find acceptable in this country. And what message does it send to young Aboriginal and Torres Strait Islander people about their culture, and what they can expect should they want to excel in sport or other fields. It is a great stain on our nation that the experience of Adam Goodes is the lived experience of many Aboriginal and Torres Strait Islander people, and there is ample evidence that demonstrates the negative impact on mental and physical health, as well as life opportunities. Racism has no place in Australian sport or our society at large. We commend the actions that have been taken inside and out of the AFL, but call on all sports and sporting clubs to develop coherent and far reaching strategies in partnership with Aboriginal and Torres Strait islander people to stamp out racism in sport. (Waleed Aly on The Project debunks some of the accusations against Adam Goodes – worth a look! There are also many informed and helpful articles addressing this complex issue of racism). A statement by the UCA President, Stuart McMillan, can be read here. ‘Not all who boo are racist but in the case of Adam Goodes, there are clear racist overtones. He dared to take a stand against racist slurs being called out from the crowd and then did a war dance that he had worked on with young indigenous players during the lead up to the Indigenous round. A part of the Power Cup, which many schools like Woodville High School enter, includes developing a similar kind of dance. As a society we are facing the underbelly of what some call the “soft racism” which underlies Australian society’.